Satguru Shri Mahayogi Paramahansa is an Enlightened Master permanently established in absolute liberation. At age eight, he spontaneously entered the state of Nirvikalpa Samadhi, or complete absorption into True Consciousness without any notion or concept, and realized Atman—the True Self. He awoke to Non-dual Reality or Oneness. The awakened state seemed so perfectly normal that he grew up completely unaware that it is actually an exceptionally rare occurrence. At age 14, seeing an image of an asana pose led Shri Mahayogi to the mystical experience of Asanas, without teachers or texts. Asanas were virtually unknown in Japan at that time, but he soon mastered the most austere poses. In his total awareness, Shri Mahayogi understood that humanity sees itself differently from who and what it actually is: True Reality. Through deep meditation, he distinctly and thoroughly unveiled the underlying structure and actual nature of the body, the mind, and the universe. Solely by direct experience, without relying on anything external, he attained the essence of Yoga and mastered all its branches, proving that they are all authentic paths to True Reality—Enlightenment or Satori. Shri Mahayogi guides each person according to his or her individual disposition, character and need. He teaches the exceedingly complex and subtle aspects of Yoga, and their application to everyday life, in a way that anyone can easily comprehend. Many who have experienced his peerless wisdom and deep compassion have found a perfect entry into Truth. As bees naturally gather around the nectar of the lotus flower, seekers are drawn to the divine light of Shri Mahayogi, and seek his guidance. Shri Mahayogi has taught the Universal Truth since 1976, when his students established the Mahayogi Yoga Ashrama in Kyoto, Japan. 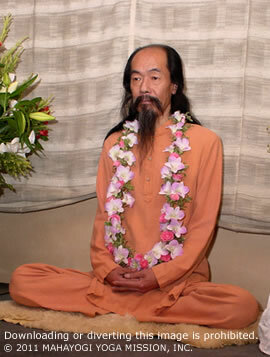 In 1996, after his first visit to New York City, disciples established the Mahayogi Yoga Mission there. He works ceaselessly at leading seekers to the Truth.